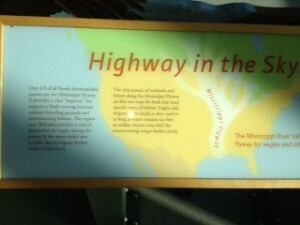 Mississippi River Flyway as Highway in the Sky at National Eagle Center, Wabasha, Minn.
Bird vs. Stadium. The builders of the new Minnesota Vikings stadium forgot to take winged creatures into account when they designed a see-through, glass-plated façade sitting smack in the middle of the North American Mississippi River Flyway. As a dangerous obstruction protruding into migrating birds’ seasonal flight path, it’s an important reminder that the Mississippi River is there for others besides humans. Nearly half of North America’s bird species and up to 40 percent of its waterfowl spend part of their lives on the Mississippi River flyway, the National Audubon Society calculates. One of the reasons for this is its visibility. There aren’t huge canyons or mountain ranges along the way to obstruct the course from the air. Another reason is the vast crop and forestland through which the Mississippi River passes, offering plenty of “off-road” resting and eating spots along the way. 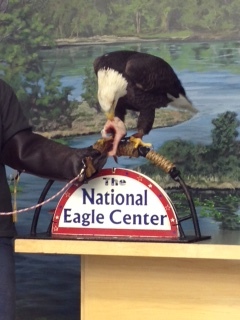 But birds aren’t the only non-human users of the river. Over 100 species of fish call the Mississippi River home. Of course specific breeds vary according to climate, and the River is currently challenged by the presence of invasive carp. Nevertheless, its role as an aquatic home is substantial. It becomes even more evident when you consider the impact of the River on the Delta at its mouth in the Gulf of Mexico. Here, the River provides (or doesn’t provide, depending on how its flow is being managed) the water and filtration making the area one of the most productive seafood resources in the world. The Dead Zone, created by nitrates and other pollutants flowing down stream and into the Gulf and wreaking havoc with aquatic life, is a not-so-subtle reminder that the River’s important life-giving role for fish also impacts us humans. I’m not sure where the battle between the bird supporters and budget supporters will conclude when it comes to the stadium. But I do know we humans have a lot at stake when it comes to managing the Mississippi River corridor for its value to animals and fish. We may not always be able to see the important link between our behavior and the many purposes the River provides. But we owe it to the River’s ecosystem to do what we can, to take all its needs into consideration, and err on the side of the River’s role when we can. 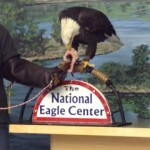 This entry was posted in Culture and History, Environment and tagged Audubon Society, Gulf of Mexico Dead Zone, Minnesota Vikings, National Eagle Center, North American Mississippi River Flyway. Bookmark the permalink.